Let’s cut the ingredients for the Napolitan. Cut off the root of the onion and chop off the top and bottom. 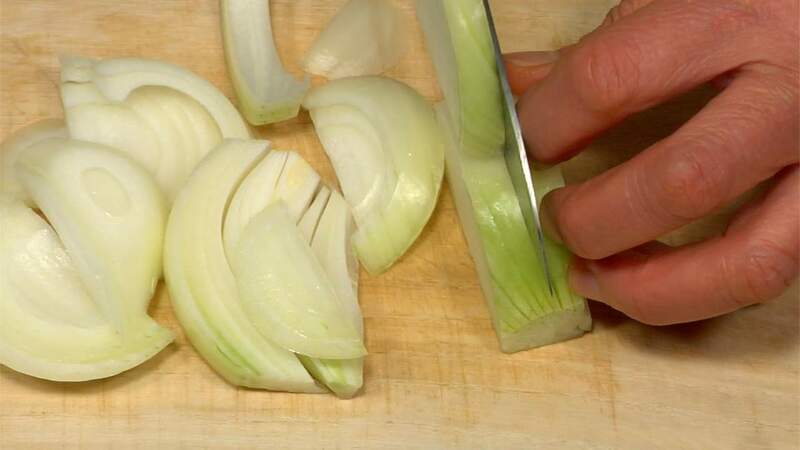 Slice the onion vertically into 8mm (0.3″) slices. 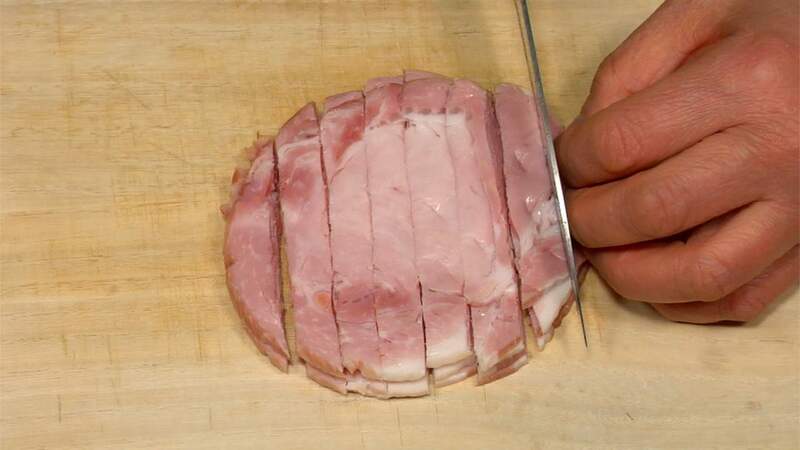 Cut the pork loin ham slices into 8mm (0.3″) width strips. Slice the button mushrooms into 5mm (0.2″) slices. Cut the bell peppers in half. Remove the stem ends and seeds. 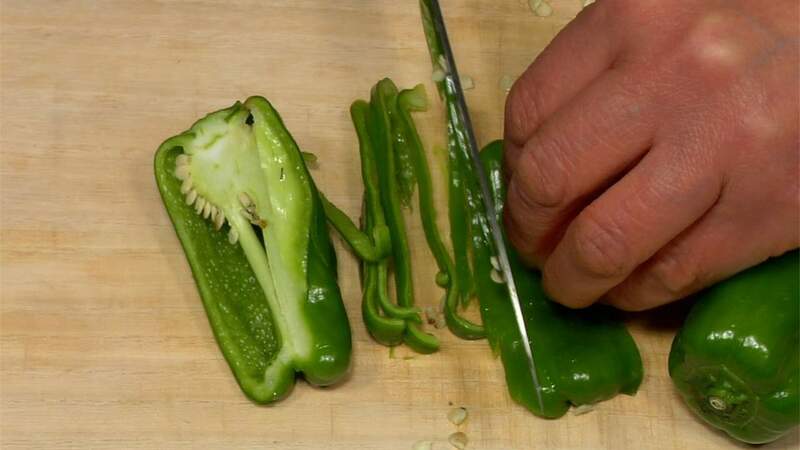 Chop the bell peppers into 3mm (0.1″) strips. Pinch the parsley and chop it into fine pieces. 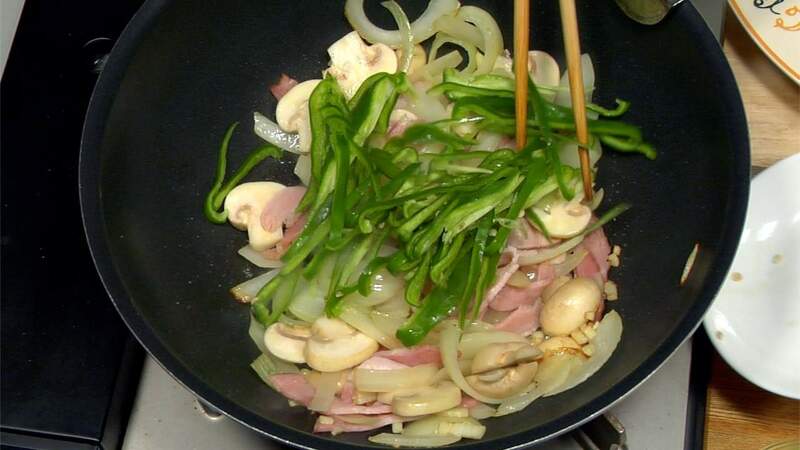 Remove the garlic sprout. Slice the garlic with the root end attached. Make cuts across the garlic parallel to the cutting surface. Chop across the other two cuts and mince well. 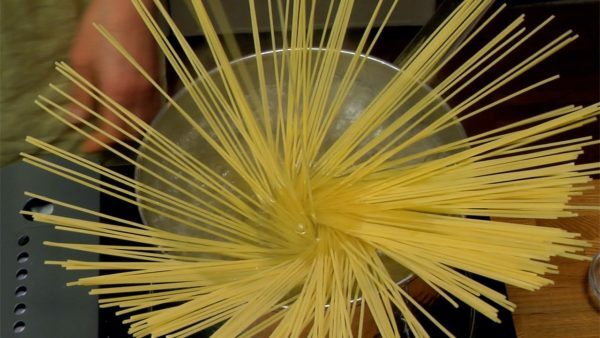 Let’s prepare boiling water for spaghetti. 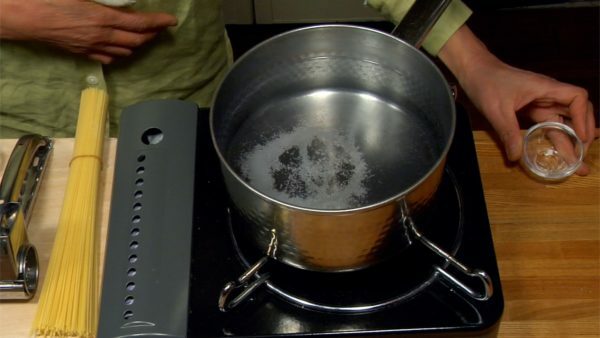 Add salt to a pot of water and let it simmer on the burner. In the meantime, let’s make the sauce. Pour olive oil in a deep dish pan. Swirl the olive oil so that it coats the pan. 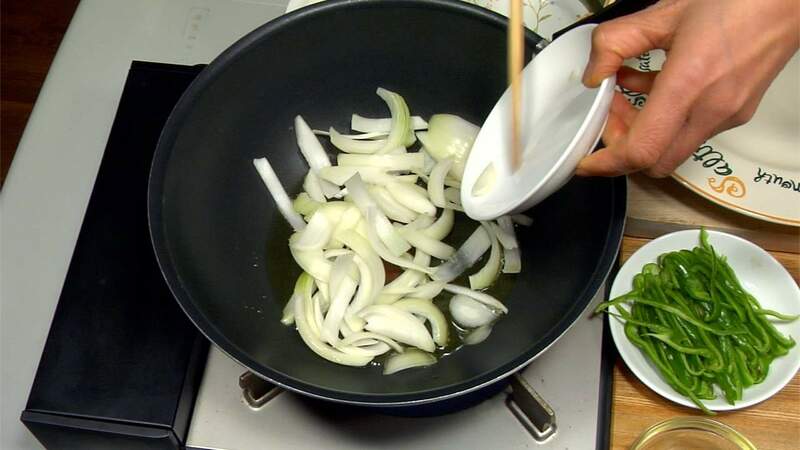 Fry the onion slices at a medium heat. Lightly brown the surface in order to bring out the sweet flavor. 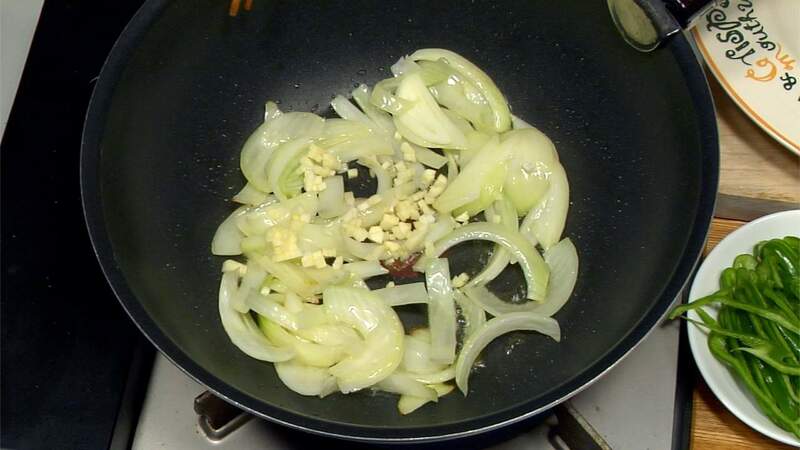 Add the chopped garlic and stir lightly. 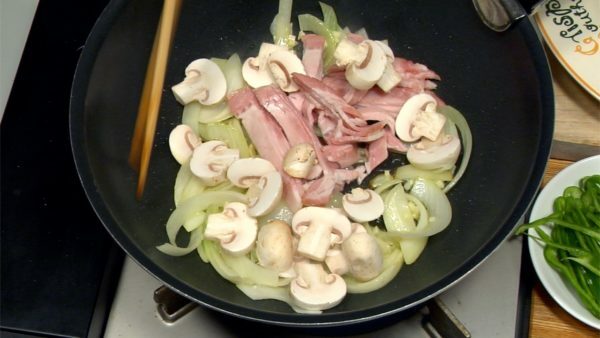 When you can smell the aroma of the cooked garlic, add the pork loin ham and button mushrooms. Stir fry until lightly colored. 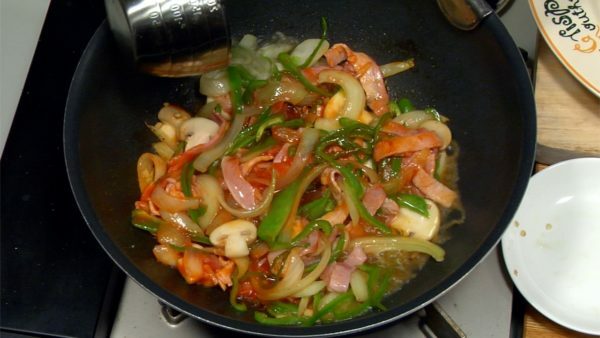 Add the bell peppers and stir. 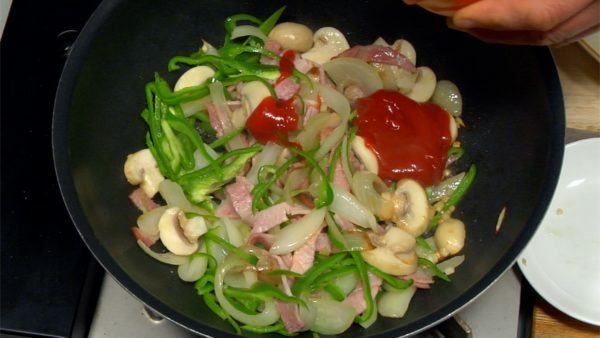 Finally, add the tomato ketchup to the ingredients. Toss to coat with the tomato ketchup. Measure around 3 tbsp boiling water from the pot and pour into the tomato sauce, although you can change the dilution of the water to adjust the thickness and flavor of the sauce. Mix the tomato sauce evenly and turn off the burner. Let’s cook the pasta. 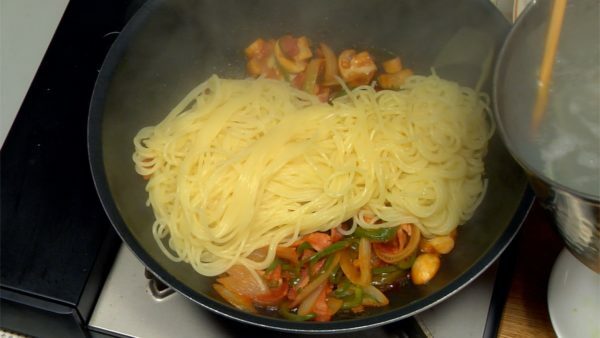 Put the spaghetti in the pot of boiling water and let it completely submerge with a set of saibashi. The cooking time varies from which spaghetti you use, so follow the directions on the package. 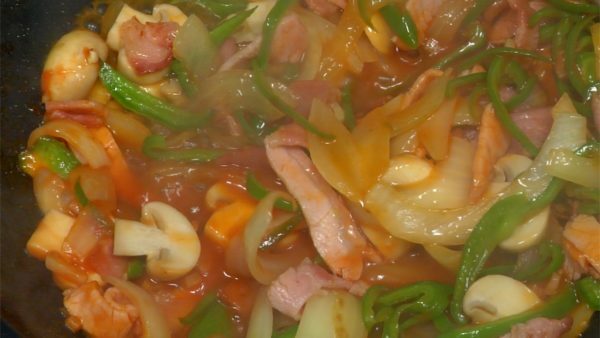 Reheat the tomato sauce for about 30 seconds when the pasta is almost ready to eat. 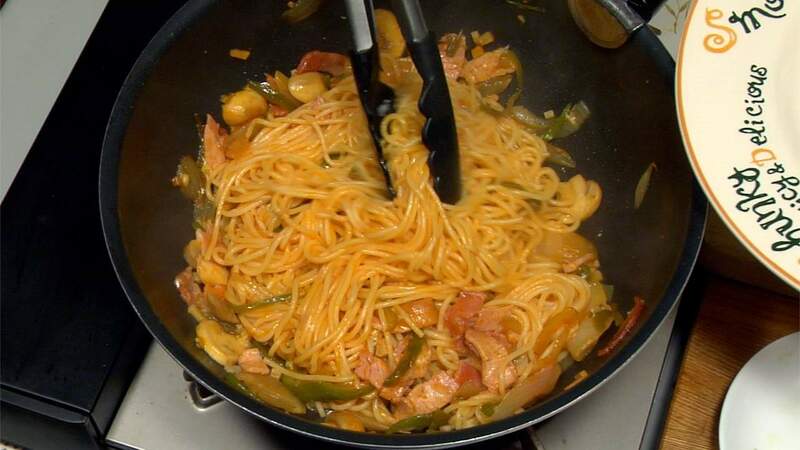 When the pasta is cooked, put the spaghetti in the tomato sauce so that it covers all the spaghetti. Add powdered parmesan cheese and butter. When the butter melts and blends into the spaghetti, serve it on a plate with a tongs. 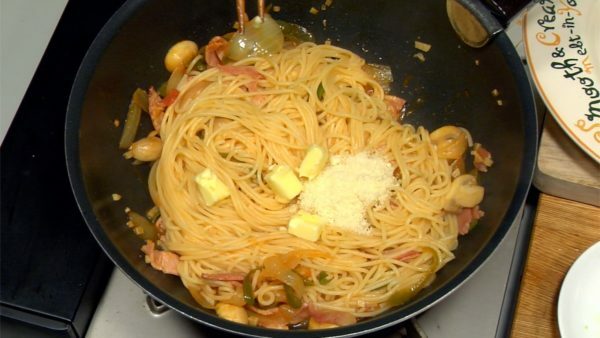 Set a small block of parmesan cheese and grate it over the pasta. You can garnish with parsley as well.